Published: May 11, 2016 to ? 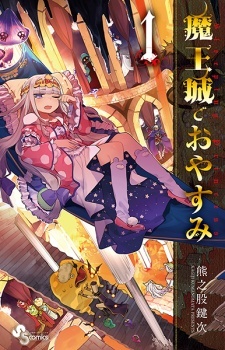 Maoujou de Oyasumi has been licensed in English as Sleepy Princess in the Demon Castle by VIZ Media. This is a manga where the captured princess is not the damsel in distress. She does what she likes and will do what ever it takes to achieve a good nights sleep. This usually causes trouble for the demons as they have to clean up the mess she has caused. What about the hero party coming to her rescue? Does the princess even care? The answer is nope. She just wants to sleep. Every chapter we are presented with a new revolutionary ingenious idea the princess came up to with enhance the quality of her sleep. This involves the theft of items around the castle to conjure up equipment for the sake of sleep, meanwhile sabotaging the demons plans and the heroes progress alike inadvertently. Often oblivious of the consequences of her actions (and she doesn't care either), all for the sake of sleep. This manga can be easily described as a unique story with unique characters, very different from the usual cliche fantasy stories. It's also packed full of funny references. You will not regret reading this and you will definitely laugh a lot in the process. I love this manga. Just so funny and adorable while also somehow managing to have a horror side it. The Princess is great in this. Just how oblivious she is to the stuff around her is great. I do kind of wish she had a bit more common sense. But oh well. I do like how the princess has pretty much made everyone in the Demon Kingdom a subject to her. Like how in the human world everyone adores her and in this everyone really dislikes it when she's gone and it's quite. I'm glad they're taking the piss out of the ' Hero" I normally dislike any type of stories were Hero's have to go defeat the Demon king. In this he's just an idiot that is decent with a sword and is mostly saved by the Princess unknowingly sabotaging the demons. Honestly i'm kind of wanting her to go back and be the Princess of the humans but i also don't want her to leave from the castle. Only way i see her ruling the humans while also still being a " Hostage" is if she just marries someone. Hell, I think the BirdGirl is the best pair up for her and Birdgirl even has an obsession with her. Just have to bait the Princess with the best bed in the world and she'd probably say yes. I do like the BirdGirl and wish we got more of her. I feel so bad for her at times. I mean she just wants to be friends with the Princess. I also surprisingly liked the Demon king. Normally i don't like guys like him and the Hero. But the character actually pulls of the role without coming across as annoying to me. The Princess is also the scariest Demon in this. Gong and chopping up ghost to use as bed sheets and just doing anything she needs to make a comfortable sleeping experience. Overall this is an awesome story and i wish we get an anime of this. Would be awesome to see.